There is no hiding it. The Sirens of Titan is sci-fi, even the cover is very explicit about it. Of course, Vonnegut has always been about extraterrestrials, planets, solar systems and faux-science, but here the narrative is only loosely tied to earth at times and the characters mere actors of a larger galactic scheme. 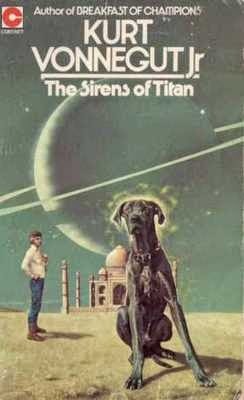 The Sirens of Titan is Vonnegut's second novel and this does show in ways both good and bad. On one hand, earlier parts of the story feel unrelated (though they are connected later on) and some of the story telling lacks the sure-footedness of Vonnegut's later work. On the other, The Sirens of Titan feels fresh and unassuming. It was written before the writers rise into national celebrity and is therefore unburdened by fame and expectations. All in all, I feel like I don't have a lot to say about The Sirens of Titan. I enjoyed it, but not as much as I enjoyed many of Vonnegut's other novels. It doesn't pretend to be something that it isn't, and does just fine in the confines of its own ambitions.